So as to uphold the standing we have built up, we are engrossed in presenting a broad compilation of Germicidal Lamp. The rate of nosocomial infections in healthcare facilities is exacerbated by pathogens present in air. With high-energy UV light, contaminated water, air and surfaces can be disinfected and cleaned safely. 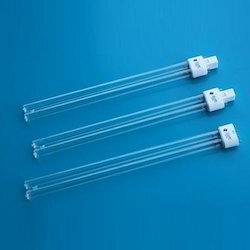 It offers a broad range of germicidal UV lamps that are manufactured from high quality quartz glass. Standard lamps and customized lamps are available. CFL in 24w, 55w etc..
Philips TUV lamps are used for killing or inactivating the bacteria, viruses and other primitive organisms. - This high-energy light destroys micro organism by damaging their reproduction system. - Used to sterilize hospital equipment. - Used as an internal technology. - UV light with wavelength less than 260 nm.